After a day of shopping in Eastwood, why not stop by Svelte Wellness Center and treat yourself to one of their clarifying or firming facials? Come on, If I were there, hello I'd be the first in line! I haven't had a facial in years! Good thing I have my Clarisonic brush to tide me away! When you do go and visit, I suggest you go for the Radiance Facial which is meant to revitalize the skin and give it that certain glow. They also offer the Eternal Youth Facial, it's for men and women who want to get rid of wrinkles. Svelte Wellness makes use of NeoStrata's exclusive Exuviance treatment, which targets skin concerns with Alpha and Poly Hydroxy Acids. But, if a diamond peel is more your thing, the you must go for their newest diamond peeling system called Micro Visage! And because the place is called Svelte after all, expect a multitude of body treatments meant to massage, purify and slim down your bod! They offer everything from stretch marks removal via Stretchmark Vanisher to Ultrafirm, a treatment that restores your body's elasticity and firmness. They can also do an Ultimate Detox program for you. But if fats are the enemy, then SvelteLipo or Liposculpt could be the answer, both are non-invasive slimming machine treatments. They also the local organic line Leyende. To my friends in Citi and IBM, when work stresses you out, you know where to go! Heehee! 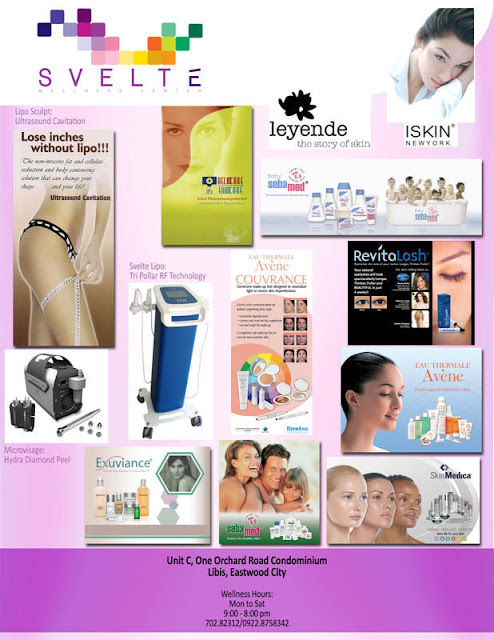 Svelte Wellness is located at Unit C of One Orchard Road Condominium. They are open Mondays to Saturdays, from 9 am to 8 pm.